Pauline on her first day of freedom. 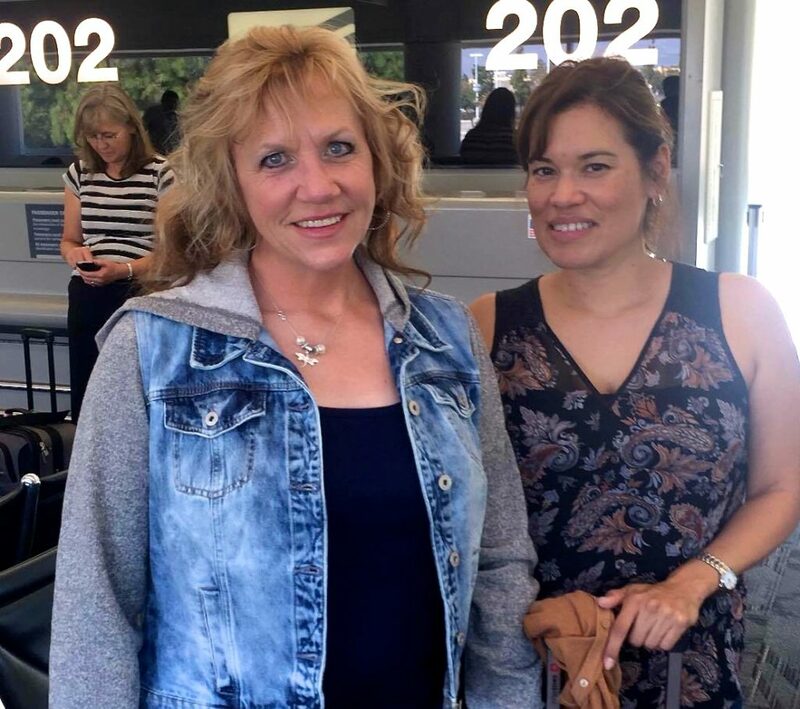 On Sept. 1st, Milena Nelson Blake of the Stanford Project picked Pauline up, took her shopping and then took her to the airport. Milena called so Pauline and Amy Povah could share this special moment after emailing one another for over two years! I can only describe myself by being completely honest – I was a raging Meth addict. I went to trial and was convicted of conspiracy charges. As far as whether people in my case who were more guilty got less time – yes, but to me we all were doing the same thing. We were all addicted to Meth and we were lost souls. I just want everyone to have a better life and hope everyone gets the help I have received so they can turn their lives around. Judge Kimball is a kind man. I think he would give me less time if his hands weren’t tied. He gave me a downward departure to 210 months because he said he had never seen any thing like what I tried to do in the county jail to better myself and rehabilitate. The government disagreed and took away the departure. Veda Travis was my prosecutor and I don’t blame her. She was just doing her job. I would like to apologize for not cooperating when it was time to answer questions for the Pre-Sentence report. My attorney told me not to answer questions because he was going to appeal my case and I think it make them mad, so my PSR paints me as a horrible person. I would like them to know that I am actually thankful because the arrest probably saved my life. I might be dead if I had not come to prison. It was all ugly and I am so embarrassed about it and cant believe what addiction can do. When I look back at that time all I see is fear, and a lost soul. The doctor at FCI Dublin told me I suffered from PTSD and made me dig it all up – everyone I loved was dying at a fast rate and apparently I had no coping skills, so I stuffed it and eventually dealt with the pain by self-medicating. The classes were hard! I am grateful for it because it changed me. I became a friend to many broken women – it was a full time job at times. We had many mentally ill woman in prison at Dublin. They just needed some love and understanding and encouragement. I treasure these holy times when I can break through such sadness with a sister and give someone a little hope and a smile and make a new friend on the compound. When I left FCI Dublin the women gave me a going away party at the Chapel! I felt such great love that day, it was overwhelming. The Native American women came to drum 2 beautiful songs and smudge me. Donna Cantrell gave me the name of White Dove … The Jewish women gave me a blessing … Some of the women sang the song “Friends” to me … The Chaplain spoke such kind words over me and thanked me for the hard work and dedication over the years while I was there. I have been so blessed coming out of the fire. 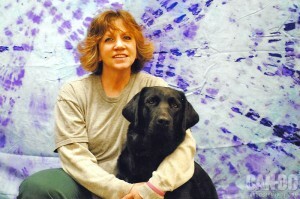 I have met some of the most beautiful people in my life behind these walls, inmates and the staff. I have said goodbye to some friends who went to the Carswell, Texas medical facility to die. That was painful. I have 3 boys Kevin, Michael and Christian. I have had one visit in these 14 years – it was my son Michael in 2005. He got in to the prison without being on my visiting list which was a miracle since that is against the rules. The addiction has been passed down – all of my boys struggle but I have faith they too will come forth from the fire and be healed. 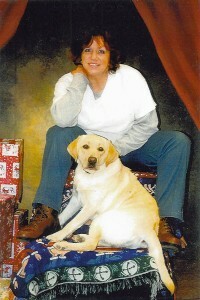 The dog program CAN-DO Canines at FCI Waseca has given me the greatest joy of all. I got to spend time with these God-like creatures, such as Eden, who went to a 6 yr old boy named Zade who suffers from autism. And Hobbs, the miracle-dog went to a man suffering from MS. I’ve read that Hobbs even helps him do the laundry, which he was not trained to do – he just knows what people need and responds. He helps his companion sleep through the night be knowing where to put his head to stop his tremors, which gives me great joy. I have completed over 100 classes, earned my GED and completed Horticulture and Grounds and Turf. Today I run forklifts and work at the commissary warehouse for the entire prison complex. I make cards for the children’s hospital. My friend, Trish Hart wrote a book called “You Are Never Alone.” She was in Dublin and has been out for many years. Her book shares a lot about me. It is her testimony of her time at FCI Dublin. She is still my best friend and really the only one outside who cares for me – this time has eaten up the love that people felt for me in my family (out of sight out of mind). I write poetry and I keep a journal … I am a strong woman and when I do get home I will do my best to restore all the love we have missed. I have a grandchild now! I hope to volunteer part-time at a homeless shelter because my boys have all ended up with out a place to sleep off and on for years. I pray that someone will find me worthy of clemency and let me go home so I can prove to others and myself that I deserve a second chance at a sober life. I now have the skills I never had access to before prison.